In 1951, Frank Stamp, DDS decided to quit dentistry in Maryland and try his hand at farming. The Stamp family moved to Lakewood Farm, a run-down peach and apple orchard on the west side of Seneca Lake. The next spring they started planting grapes. The original grapes planted were primarily Labrusca and French-American Hybrid varieties, which were favored by the large wineries and grape juice companies. In the mid-80?s the family diversified to add some new hybrid varieties and Vinifera plantings. The commercial grape production continued for 36 years, until 1988 when Monty (Frank's son), Beverly and their children pressed the grapes for their first vintage. 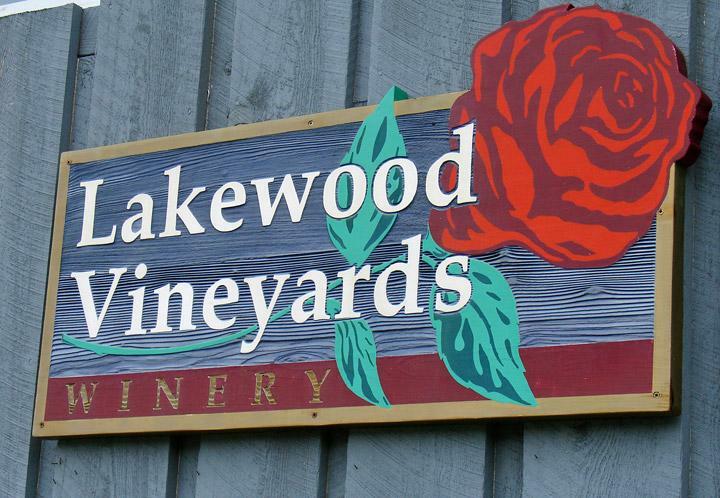 Today, with 80 acres of grapes planted, the farm is home to Lakewood Vineyards winery. The winery produces wines from all three families of grapes, offering a very diverse selection of wines. The vineyards have been maintained and expanded as the demands for varieties shift. Using a combination of cutting edge technology and traditional winemaking practices the Stamp family, working with a very dedicated staff, is committed to producing consistently high quality wines. The friendly retail room is open for tasting and sales daily. "This scarlet colored port has a big nose of plums and currants. The palate is velvety and warm with lingering notes of cassis and a hint of anise. The perfect accompaniment to cold nights and warm fires. This Port is delicious with flavorful blue cheese or rich dark chocolate." "Plum, jammy notes & soft tannins finish smooth & dry. A versatile food wine with grilled & baked dishes." "Light peach, apricot and citrus nose, a perfect balance and a crisp finish." Opens with bright aromas of pear, citrus and a hint of peach. The palate is balanced nicely with a touch of sweetness and moderate acidity. Great served with BBQ chicken, and luscious enough to sip by itself. This lush Pinot Gris greets the senses with exotic aromas of honeydew melon and kumquats. The palate is a mouthwatering mix of peach and green apples, finishing with lingering notes of tart pear. Our 2014 Riesling opens with bright aromas of pear, citrus and a hint of peach. The palate is balanced nicely with a touch of sweetness and moderate acidity.